Aetna, BCBS, Cigna, HealthChoice, Humana + United Health Care. We will do preauthorization, contact us today! Hi! I’m Kristen. I am an Oklahoma-based functional registered dietitian nutritionist and registered nurse. As your nutrition and prevention expert, I provide individualized nutritional therapies and other wellness strategies to help you find a happy weight, feel your best, and get the most out of your life. I do this through thorough lifestyle and diet assessment, nutritional and supplemental recommendations, education, inspiration, continual coaching and support, motivation, and most importantly connection. I take the best from conventional and functional nutrition practice to help you achieve your goals. Let me help you learn what it means to truly BE WELL! 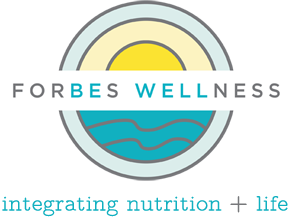 The goal of Forbes Wellness is to help people improve their overall health and well-being by creating personalized nutritional shifts and sustainable lifestyle changes. My strategies work with you to achieve balance and to rediscover what makes you feel good! I work by providing education, coaching, support, motivation and connection. And we keep it real! Call today to get scheduled! Let’s BE WELL together! Get weekly health and lifestyle tips delivered straight to your inbox.